I am one of those people that will give ALMOST anything a chance. The idea is I shouldn't judge until I know for myself. Besides, it is only one time,if I don't like it, there won't be a second try. With this in mind, I often find myself trying new products, food choices and activities. Most of the time, I would say the process is more fun and exciting than expected. Although I am a big fan of sushi, I have always avoided more adventurous Japanese fusion cuisine. 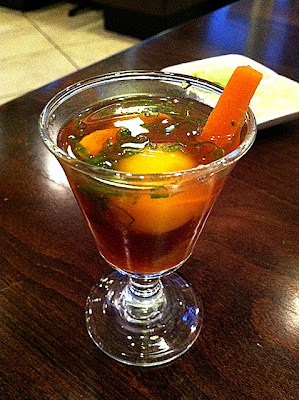 Upon urging from a friend, I decide to give Uni sake shooter a chance. Honestly, I wasn't crazy about the idea because there was a raw quail egg yolk in the shooter. Afterward, I must say the experience wasn't half bad. I don't know I would order it often but it is a topic for sure. In life, I think we often shy away from new things, preferring to the comfort of what is known and stable. However, in order to grow, it is important to reach out to new territories, even if we are uncomfortable. Most of the time, the thing that scares us in the beginning isn't all that bad at all. It is a truly waste of a beautiful life if a person is the constant observer instead of living and trying. How can we become a beautiful butterfly from a plain caterpillar if even we don't give ourselves the chance to transform? Yummy!!!!! look delicious! Great blog I'm following! ooh I just love saki! Crazy but you can say you tried it! It is good to break out of our comfort zones once in a while! YUM! I want to try that.